A former SF State official is facing 128 felony counts for allegedly taking bribes costing the University millions of dollars. Robert “Bud” Shearer, a former SF State director of Environmental Health and Occupational Safety, stands accused of involvement in a seven-year bribery scheme that stole millions of dollars from the University while students faced increasingly frequent tuition hikes, District Attorney George Gascón said. Today Shearer and Stephen Cheung, his alleged accomplice, appeared in a San Francisco courtroom, but had their arraignments pushed back to Friday, April 26, after neither man entered a plea. 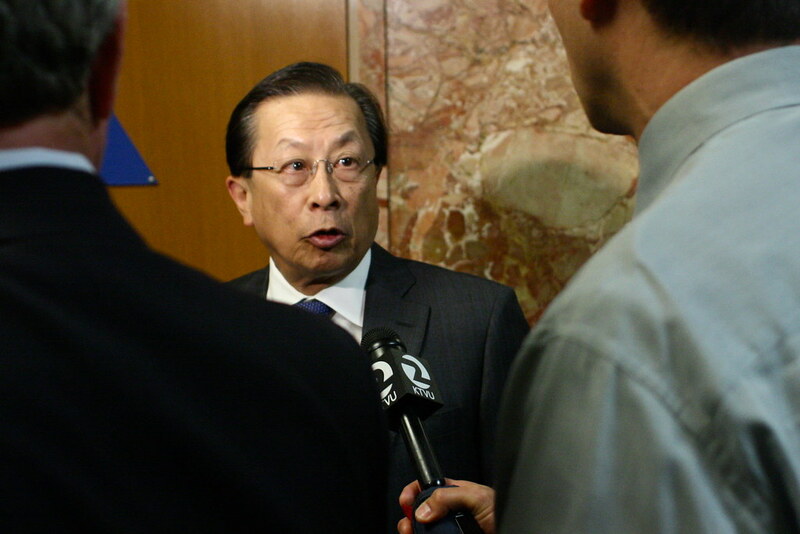 Cheung was the owner and operator of Chemical HazMat Technology, a company that the District Attorney says Shearer routinely allowed to overcharge SF State for hazardous waste removal and other services in return for personal loans, monetary payments totaling up to $183,000, trips to China, and a car. After Shearer left his job as director and Cheung’s company was replaced, SF State’s yearly spending on hazardous waste removal services went from $730,000 to only $176,000. According to the District Attorney’s office, Cheung allegedly started bribing Shearer in 2002 and continued to do so until 2009. Shearer, a former helicopter machine gunner during the Vietnam War, was arrested on April 18 at his home in Fremont, without incident. But Cheung was only just arrested yesterday after a high-speed car chase that began at 46th Avenue and Taraval Street. Cheung crashed his car into unoccupied parked cars at 44th Avenue and Ulloa Street. He then fled on foot before he was arrested by the San Francisco Police Department. Both defendants are currently in custody with bail set at $5 million each, and could face more than 100 years in state prison if convicted, according to the District Attorney’s press release. Garrick Lew, Cheung’s attorney, isn’t sure if two days, the amount of time the arraignment was pushed back, will be enough time to get through the large amount of charges. “The case is clearly complex, so it’s going to take quite a while to dig into this and get to the bottom of it,” he said outside of the courtroom. Shearer is being charged with 128 felony counts — 59 counts of commercial bribery, 59 counts of accepting a bribe, five felony counts of making a contract in an official capacity by a financially interested person, and five felony counts of perjury. Ian Saunders, a cinema major, was surprised to hear about the alleged bribery scheme. “I’m shocked that people do that and I find it strange that I haven’t heard anything about it,” he said. SF State bribe scheme defendants plead, "Not guilty"
Bud Shearer is my brother. I have not talk to him in years, because he was stealing our dying mother’s money. I am writing this to let you know my brother was never in Vietnam, let alone a machine gunner. He has never received a purple heart. This is just another one of his scams.